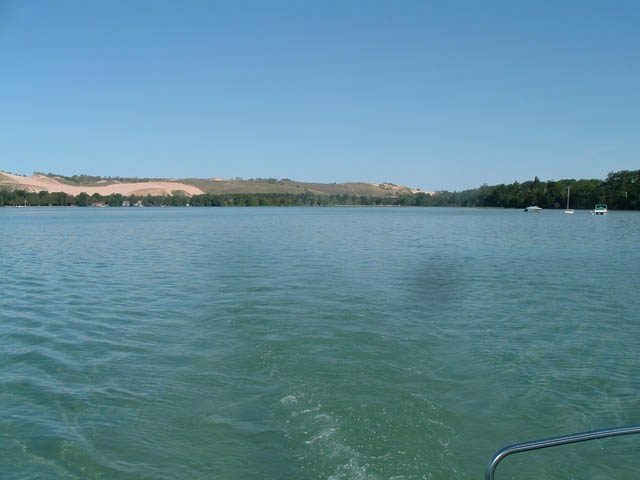 It would be very easy for a foreign invasive plant to overtake Little Glen Lake. If that happened, the sandy bottom would be filled with a tangle of weeds reaching all the way to the surface. to wash their boats before putting them into their local lakes. glacial dunes that lead to the eastern coast of Lake Michigan. want to find them early. milfoil. That’s a long, thin plant with feather-like green leaves. you don’t wash your boat. agency doesn’t like this new local law. property. He says a voluntary approach is enough. law, to make sure boats don’t bring in new invaders. It’s off-season for charter boat fishing and Captain Wayne Banicky asked if we could meet at a local watering hole called the Boat Bar. Captain Banicky takes people out fishing on Lake Huron. Well, he used to. The past few years he’s been charter boat fishing in Lake Michigan. 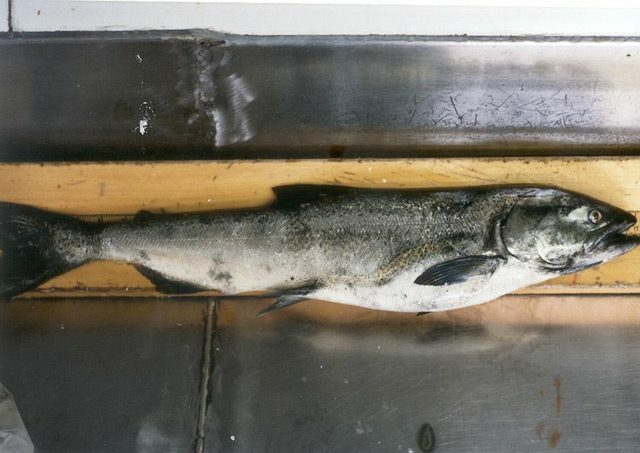 He says fish started to become more scarce on Lake Huron, and he was forced to make the move. 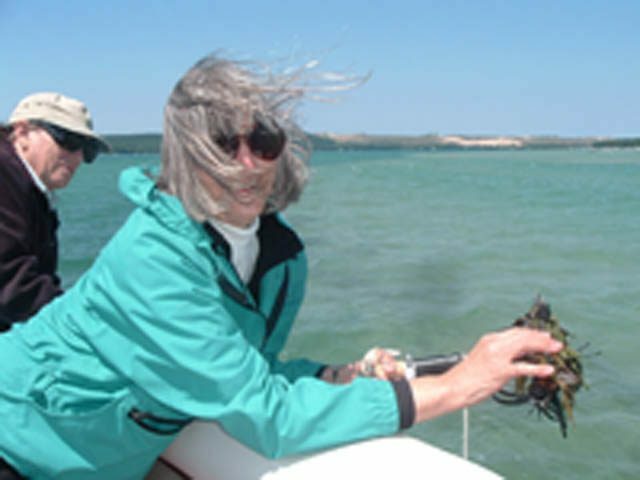 Fishing for most species in Lake Huron is not good. 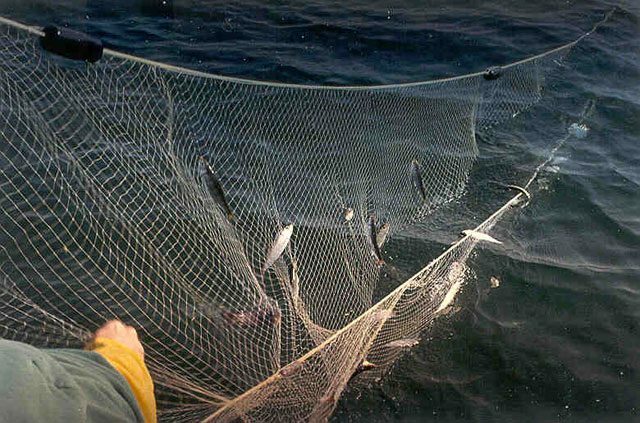 But the story is not just a matter of not stocking enough fish or just a bad year, it’s a matter of a collapse of the bottom of the food chain. It’s not just the fish sport fishers like to catch that are down, it’s their prey: the smaller fish those big game fish eat. 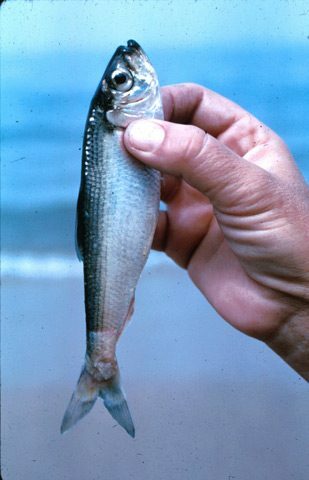 Prey fish stocks have collapsed, and supplies of the food those small prey fish eat, the plankton, have also collapsed. Jim Johnson is with the Michigan Department of Natural Resources Alpena Fisheries Research Station. 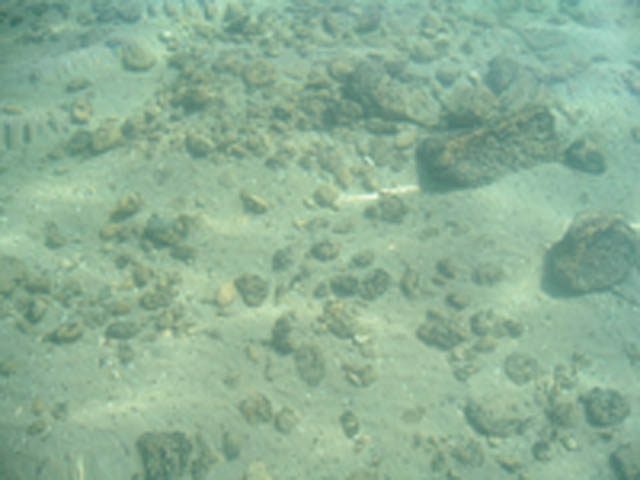 Scientists from different government agencies and universities in the U.S. and Canada had been noticing changes, but things have gone seriously wrong very quickly in Lake Huron, and it might go wrong other places. 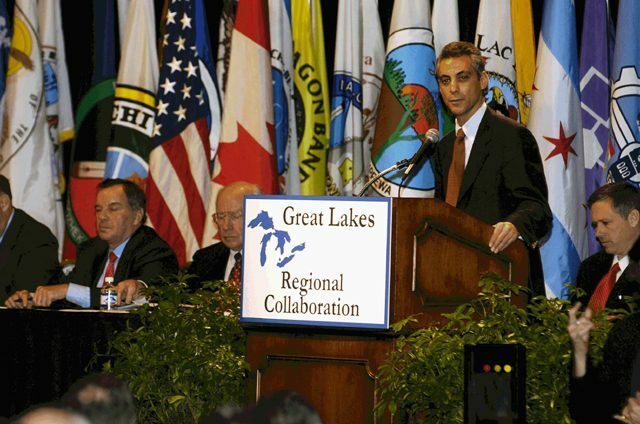 Tom Nalepa is with the National Oceanic and Atmospheric Administration’s Great Lakes Environmental Research Lab. 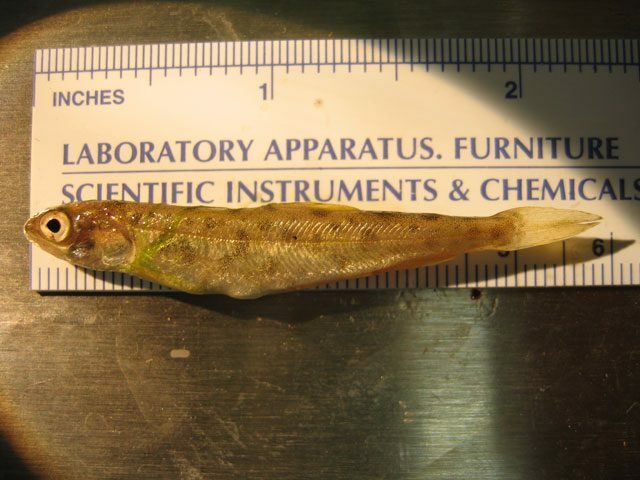 He says tiny aquatic food sources for fish, such as a shrimp-like organism called diporeia, are declining dramatically in other Great Lakes. And sport fishing is multi-billion dollar industry in the Great Lakes. Back at the Boat Bar, charter fishing boat captain Wayne Banicky says fishing is still good in Lake Michigan, but he worries when he thinks about what happened in Lake Huron. But the question is what? 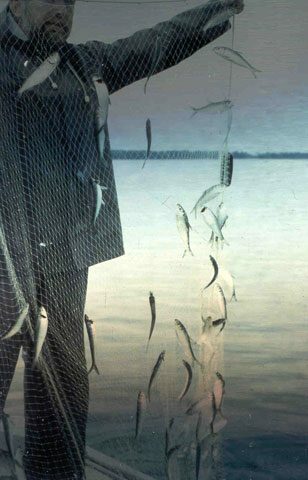 What can be done when invasive species are changing an entire ecosystem to the point the fishery collapses? And guys like Captain Banicky aren’t the only ones worried. Jim Johnson at Alpena Fisheries Research Station says you can’t undo the damage that’s already done. It’s just a matter of waiting to see how nature responds to the invasive zebra and quagga mussels and other invaders. Johnson says the key is to prevent more invasive species from being introduced to the lakes. The source of many of these invasive species is the ballast tanks of foreign ships entering the Great Lakes. Some regulations have reduced the chance that more invasive species will hitchhike to the Great Lakes, but more are still getting in. In the meantime, agencies such as the US Environmental Protection Agency and the US Coast Guard say Congress hasn’t given them the authority to regulate foreign ships strictly enough to stop new invasive species from entering. So, fishery managers can only watch the other Great Lakes for more signs of a collapse of the fisheries as they’ve only been able to stand by and watch happen in Lake Huron. predawn light of this spring morning. Conservancy and known as the Bluestem Prairie. 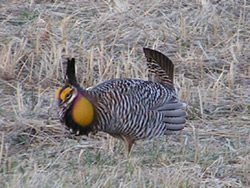 estimated 2,000 prairie chickens in Minnesota. says the birds won’t survive without a genetic infusion. of acres of marginal farmland back into grassland. And that’s going to require larger grassland areas. 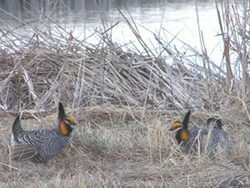 states to support healthy numbers of prairie chickens. needs to be returned to prairie. 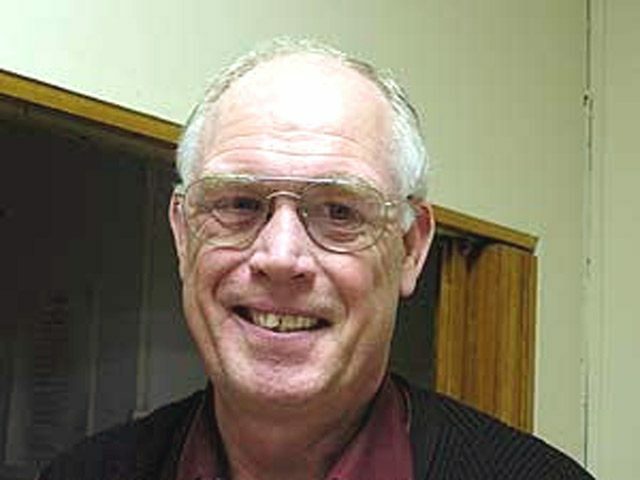 For the GLRC, I’m Dan Gunderson. toad survey in the early part of the summer. Many groups are now using so-called citizen scientists to collect data. the Friends of the Detroit River. Petrella is standing beside one of her more loyal volunteers… Al Sadler. protection has become an absolute necessity. scientists simply because they don’t work for the government. discovered on a national wildlife refuge last spring by a photographer. 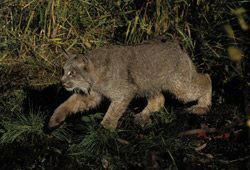 the state is home to a viable cougar population. their state’s wildlife can only be a good thing. collection, including the U.S. Fish and Wildlife Service. And these science teachers aren’t far from home either. They’re at the Lake Michigan shoreline pulling out a 150 foot net to catch fish. The teachers are getting an in-depth look at environmental issues near their homes in Michigan. And in return, they’ll weave those topics into their lessons this fall. Today, their task is to catch a sample of fish, identify them by species, and to figure out whether those types of fish can survive in polluted waters. In the end, they’ll decide whether to let a hypothetical development group build a marina here. Michigan Department of Natural Resources biologist Todd Kalish built the scenario based on proposals he’s seen. Kalish says dredging will stir up sediment that can hurt some types of fish. 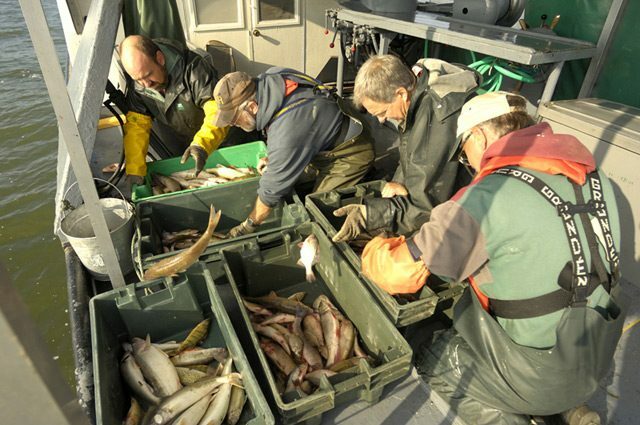 Simply labeling fish will get some students’ attention, but Kalish says teachers can get more interest from more students by combining that lesson with his marina proposal. And it will also teach students how the environment is affected when we build things. This training is the brainchild of Mary Whitmore, a curriculum developer. She’s using students’ local communities to inspire them to care about science, and she’s using science to inspire students to care about their communities. Whitmore’s setting up similar trainings in a lot of towns. She says investigating each community separately is a lot of work, but it’s necessary. Whitmore says that’s particularly true with life sciences. She says the subject’s ultimately about diagnosing and solving problems. And just talking about what some scientist has already figured out or simply labeling a fish misses the critical point for students. Who cares? Whitmore says that’s especially true today when fresh water seems to come from bottles, instead of from a stream or a creek and produce at the grocery store rarely comes from a local farm. She says these days we’re not really connected with the environment that keeps us alive. But Whitmore says with the help of local environmental groups and other community partners, teachers can fit those lessons into the standard curriculum. Whitmore says teachers who attended her first training last year changed how they teach. They’re doing projects that mean something to students. One’s working with students to build rain gardens, others are raising salmon. Teachers here today say it was already their goal to incorporate local issues in the classroom, but some say they couldn’t effectively teach on local issues because they didn’t understand those issues themselves. Christie Jenemabi Johnston teaches seventh through twelfth grade. She was impacted by a tour of the local wastewater treatment plant. And she says knowing those things can help her students to get involved in their community. Of course in the end, if this model is to be truly successful it has to grab the attention of students, not just teachers. While the teachers were taking fish from the nets, a couple elementary-aged children were swimming nearby and they came over to see what was caught. If these kids are any indication of student response in the classroom, the programs just might work. man is the latest person to be caught and convicted by the operation. A Columbus man has been sentenced to a year in federal prison for illegally buying and selling fifty-three Blandings turtles, protected by federal law. Over the past three years, fifty-seven other dealers in the region have been convicted for illegal trading in turtles, snakes, and lizards. 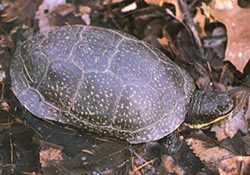 Jim McCormack of the Ohio Natural Resources Department says Ohio’s population of Blandings turtles has been decimated by wetlands destruction along Lake Erie. He says the thousand or so that survive must be protected so they don’t go extinct and prompt a domino effect on other animals and plants. For the GLRC, I’m Bill Cohen. very differently. They collected bird eggs. Carrol Henderson considers himself a very lucky man. He’s the director of the non-game wildlife program at the Minnesota Department of Natural Resources. He grew up on a farm in central Iowa. Last summer, he learned that a family in his old neighborhood was renovating a farmhouse. It had belonged to Ralph Handsaker. When Handsaker died thirty years ago, the house was boarded up and left alone. The smallest egg, from a hummingbird, was small enough to sit on top of a dime. The biggest was an ostrich egg almost six inches long. Some were creamy white, others were speckled, others streaked with color like a Jackson Pollack painting. There were more than 3,600 eggs, representing more than 400 species of birds from all over the world. And they were in perfect condition. This is how nature-lovers expressed their passion in those days. They called themselves oologists. They kept their eggs in drawers lined with cedar sawdust to protect them from insects. They also kept meticulous records. 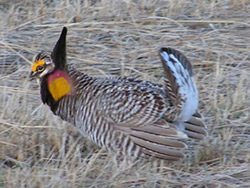 The birds disappeared as people turned prairies into farms. But Carrol Henderson says the records in the bird collection provide detailed information about where and when they nested. Henderson says these collectors didn’t think they were harming the birds. That’s because if their eggs disappear, most birds will lay another set. 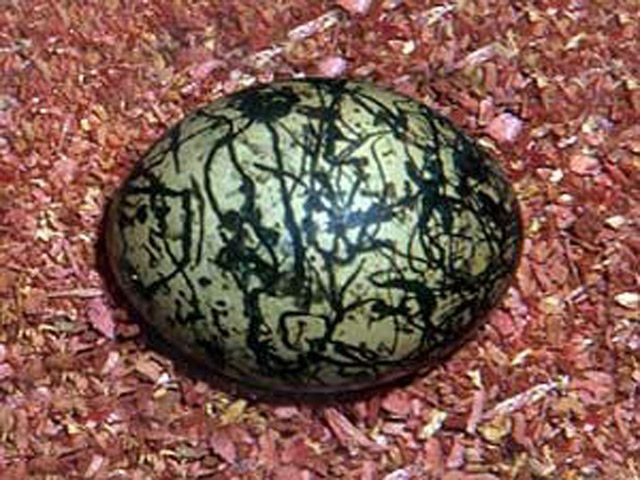 But competition for the eggs of rare birds was disastrous. Eventually, attitudes began to change. In 1918, the federal government passed the Migratory Bird Treaty Act, to protect birds and eggs. But the government let three collectors keep on collecting. One of them was Ralph Handsaker. So his collection goes into the early 1950’s. Carrol Henderson says there’s a lot to learn from these eggs. One of the best lessons is about human responsibility. Henderson says people these days enjoy nature differently than they did a hundred years ago. But we can still learn something from earlier methods. 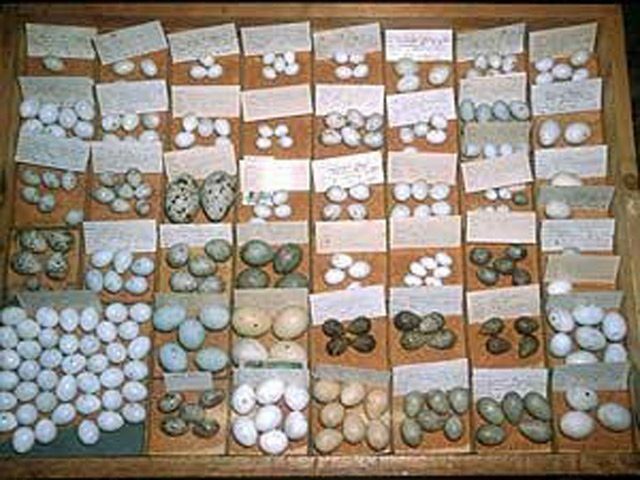 Carrol Henderson’s article about the Handsaker egg collection will appear in the October issue of Birders World magazine. The Handsaker family is planning to donate the collection to a major university. species list since 1986, when the number of nesting pairs dwindled to 17.
say the bird still needs protection. numbers increase to 150 healthy nesting pairs, for 5 consecutive years. For the GLRC, I’m Tom Kramer.